Hi everyone! Happy St. Patrick's Day!! Today I'm posting my first origami box. Anne (Stamps and Paper) made several gorgeous boxes posted them on her blog a couple of days ago. And she also added the link to the instructions - click here. Thanks Anne!! This was fun to make ... and not difficult at all ... just a lot of folding. And the base and lid are made with less than 3 - 12"x12" sheets of DP / cardstock. It's a pretty amazing piece of engineering! How elegant and stylish! I don't see any faults in your decorations -looks perfect to me. Amazing job! so pretty Loll! You sound like me! Second guessing yourself! I think I'm done and then I remember, oh, I was going to do this or that or I decide to change out something like you're thinking here! So glad I'm not the only one! Although I bet I'm worse about it then you! lol Thanks for sharing! Have a great week! What an exquisite project! The lace and the roses are perfect! 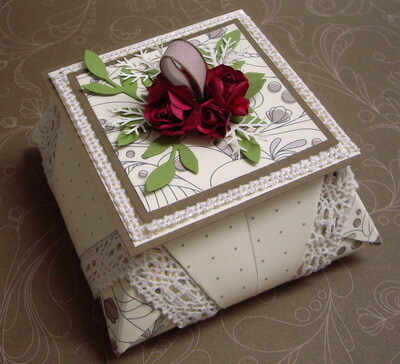 Wow.....Stunning box Loll. TFS the link. I hope to try soon. These boxes are lovely aren't they Loll....both Anne (Stamps & Paper) and I made several of these as samples for the girls in our craft club for last weeks class projects. Would definitely use your glue gun - I did and it's so much easier! I find the rose dies are fantastic for this kind of project as you can match colours so well without having to rely on your stash of flowers. Good gosh golly Loll that little box is darling. and then I feel embarrassed again. Thanks for your visit and kind words. It truly brightened my day. What a beautiful box! I love the roses and lace! I'll have to give it a look although paper folding doesn't come easy to me. It looks so worth it though! This is a beautiful box. You sound just like me also. The red roses and lace makes it look so ELEGANT against the greys and creams. You can use anything on these boxes to decorate them. Just let your imagination do the work. I think you've done a great job!